B.A., University of Illinois, Urbana-Champaign (1996); M.A., New School for Social Research (1999); Ph.D., Columbia University (2005). Professor Fronc is a historian of the twentieth-century United States; more specifically, her scholarship seeks to illuminate the role that private, non-state actors have played in social control and the production of social knowledge. Her first book, New York Undercover: Private Surveillance in the Progressive Era (University of Chicago Press, 2009), examined how five different organizations, staffed by social activists, empowered themselves to police gambling, sexual behavior, interracial sociability, perceived juvenile delinquency, and radical political commitments in the two decades before World War I. Her second book, Monitoring the Movies: The Fight over Film Censorship in Early Twentieth-Century Urban America (University of Texas Press, 2017), begins from the premise that motion picture censorship was an important site at which multiple stakeholders negotiated the role of the state and the meaning of the First Amendment in the early twentieth-century United States. It offers the first full-length study of the pioneering work of the National Board of Review of Motion Pictures (NB), a civic group founded in New York City in 1909, and its campaign against “legal” motion-picture censorship in the decades before industry self regulation prevailed, and the Production (Hays) Code was implemented. Professor Fronc is also a public historian; she serves as Consulting Scholar for the Lower East Side Tenement Museum, and regularly participates in the UMass History Institute and professional development programs through the Collaborative for Educational Exchange. 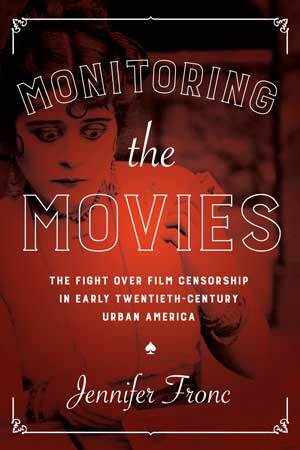 Monitoring the Movies: The Fight over Film Censorship in Early Twentieth-Century Urban America, University of Texas Press, 2017. New York Undercover: Private Surveillance in the Progressive Era. University of Chicago Press, 2009. Tuesdays, 11:30-12:30 and Thursdays 2:00-3:00, and by appointment.